Frugal & Fabulous: Giveaway: Skype Wireless Headset & Voucher (3 Winners!!!) - CLOSED! Giveaway: Skype Wireless Headset & Voucher (3 Winners!!!) - CLOSED! Ever wished you could save money on your phone bill? Are you looking for a way to cut your cell phone bill? Check out Skype, a whole new way to communicate! With Skype you can talk, chat and video call anywhere in the world for free* through your internet connection! You can also send a text message directly from Skype; forward a call to your cell phone; or set up an online number that friends and family can use to make a local call from their old-fashioned phone to your Skype, wherever in the world you are. 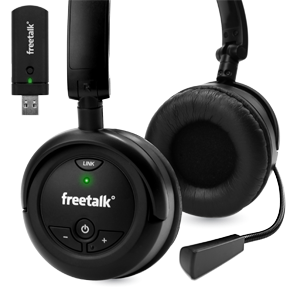 3 Lucky Readers will each win a FREETALK Wireless Headset and a 3 month, UNLIMITED WORLD Subscription Voucher! :) The headset itself retails at $79.99! "This is the headset for anyone who wants to have it all. Super wideband audio, simple to use, luxuriously padded and it sets you free from the computer. Now you can have your Skype calls from where you want." This would make a wonderful father's day gift - wouldn't it be nice to be able to connect with friends and family -wherever they are in the world? I'm the queen of multi-tasking so for me, the wireless would be super helpful. Wouldn't it great to be able to talk while having your hands free to fold laundry, give yourself a manicure or cut coupons?! Proprietary technology designed to deliver the highest quality audio clarity. USB Plug- and-Play, no need for complicated pairing or set up, no software installation required. At least 5.5 hours of continuous use per charge. Omni directional boom microphone for superior voice for superior voice quality. Up to 15 metres effective range. 1. Go to the Skype web site and tell me one thing you have learned. Goodluck! You have until Monday, June 29, 2009 at 7pm EST to enter! My best friend lives in Germany and I would love to be able to talk to her more! I used Skype for the first time a couple of weeks ago. My best friend was in London and I got to talk to her for free! Plus it was a video conference. How cool is that? It's really good quality too! I learned that you can even call phones and mobile phones for a low rate! I just Twittered you link! I love Skype! I looked at the Skype website. I have Skype now but I only use it for video computer to computer calls. It is usually crystal clear and no webcam freezing as on yahoo messenger often does. I learned so much on the website...but I wasn't aware of all the features involving the use of mobile phones! Excellent. I hope i win! Yay for this contest! I subbed to your email list! I need to use Skype to keep in touch with friends in Africa. I learned from skype that it is Easy and fast – text message directly from Skype. Type long and eloquent messages from the comfort of your keyboard. Reach friends instantly anywhere in the world. My in laws have skype...and I got a webcam for Christmas. I haven't set it up yet, and I haven't downloaded skype yet. I don't know what I am waiting for, but I really need to get it done! This headset would make it much easier to start in with it, I'm sure! I have a 2 year old. Both of her aunts and her inlaws all live out of state...so I need to get going on skype-they want to see her more often and it would just be so much fun for her to be able to see and talk to them, too! thanks! Your button is on my sidebar, thanks! I learned that you can get voicemail with a skype subscription. I guess it makes sense for the people who have it as their regular phone line! thanks! I would call our relatives in Greece. It’s really easy to call a friend from Skype. Locate the person you want to call in your contact list and click their name. To call your friend for nothing, simply click the green button. This will start the call and you can talk for as long as you want, whenever you want. I think Skype is great especially if Oprah likes it. I find it great that there are free calls available too, my little one could talk to her grandparents in South America if I win this!! This would be awesome. Right now when I SKYPE I use the headset that came w/my son's Spanish software! I would love to win this. My entire family (parents and 4 siblings) and inlaws live in another state. It would be nice for the kids to get to talk to grandparents more! Wow, you can use it MOBILE, Wooohoo!! Button added to my scrolling list of buttons! oh, this is so great!!! i would love saving money on my phone bill, and this is nearly FREE! This would allow me to change from an expensive cell plan to pay-as-you-go! I'd love to video skype with my Father in Law who is deaf! That way I could talk to him and my Mother in Law! I learned that you can even hold conference calls! I had no idea! I just subscribed via google reader! i love how easy it is to use and the price! I've lived on 3 continents and use skype to call all over the world. I call my folks every other day who live in another country and watch my niece grow up via webcam. The advances in clarity of voice and cam are amazing in skype. Last weekend I was on a call and took my headphones off to answer the door but my leg got caught in the cord and ripped the cord apart, now I have no headset for my computer. I'd use skype to call friends that are overseas. I could call my parents and they could see their grandkids while they talk to them. Or, my sister in Indiana. No overseas friends, but I could let my brother-in-law use it to talk to his sons in Germany, too. I learned that you can use skype on your mobile phone. i love love love it! I like that With Skype you can talk, chat and video call anywhere in the world for free. Oprah loves Skype so I know I will too! Call forwarding – never miss a call even when you’re offline in Skype. I would love to win this! Right now I only have a cell phone & the reception is awful in my home. It would be wonderful to actually talk w/out getting cut off mid-sentence! I went to the Skype website & found out that you can make calls to people who don't have skype. I thought it was just a skype to skype type deal. That's cool. I might use this instead of a landline. I'd talk with my grandmother! This is a great way to keep in touch! Jamie @ I Am A Money Magnet! I love that the calls are free and that that you have the options to see the person you're talking to! Your blog button is on my site! I love that Skype is free(mostly)...that's it's helping friends and family connect! Yay! I learned you can get Skype on your mobile even your PSP! Button is on my sidebar! Cool tech giveaway! I think Skype interests me because you can kiss phone bills goodbye! I went to Skype and found out that you can make free video calls! I never knew that such a cool function! I subscribed to the blog! I would use Skype to talk to my friend over the Internet, as well as my sisters! I have family all over the North American continent & would love to talk with them via Skype. My mom & step-dad are in Canada, dad & step-mom travel all over the world & brothers are in five different states. I love skype for its affordability. I would use it to call my family in Ukraine. I learned that my friends can call me on a regular phone and reach me on Skype, anywhere. I learned that you can Skype with people who don't have Skype. 10 years ago I was an exchange student, and made many friends all over the world. We keep in touch via facebook, the occasional landline call, and old fashioned snail mail. It would be amazing to talk to them via skype, see their faces and hear their voices. It's the next best thing to being there! Just sent out a Twitter shout out! I use skype to talk to my husband in Iraq and the wireless headset would make things much easier with our kids. I learned that Skype has a mobile app too. I travel a lot and it would be fab to be connected to my family. The first person I would contact using Skype would be my twin sister. I'm the the US and she's in UK. I have friends now living on the other side of the world and this would be perfect to continue to chat with them without worrying about huge phone bills! * I would love to have this to start my own BlogTalk Radio show. I learned you can Get superior sound quality with a headset. Although I don't really know a lot about Skype, the video part interests me the most (and the cool headset too). I would call my girl Sara. I love the sound quality the headset offers- that, and the skype video is really cool!